The 2019 European Elections will be taking place in less than a year. Yet by and large, political parties do not seem particularly interested. There’s no campaigning. Parties aren’t talking to members. No plans are being drawn up. If the European Elections sometimes feel like an afterthought, it’s at least partly because parties seem to treat them as such. Trying to answer why this is can be a bit of a chicken and egg problem. 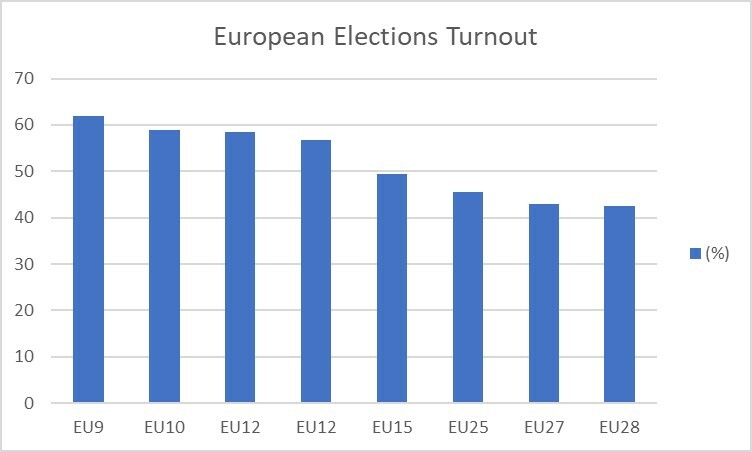 Turnout for elections to the European Parliament have been low and getting lower for a number of years. This trend is shown in the chart below, using official EU data. So do parties not make an effort because citizens are uninterested or are citizens uninterested because parties do not make an effort? Certainly part of the trend in falling turnout is due to the expansion of the EU (shown along the bottom of the chart), bringing in states with historically lower levels of turnout and less well-established democratic traditions. Even when this is taken into account, however, turnout still falls even when EU expansion is static or very small. It’s possible that turnout will now stabilise around the 42% mark, but this is still a low turnout when compared to national elections in many European countries. In trying to understand the lack of interest, there is a third option that could help us resolve our chicken-and-egg dilemma. The reason neither voters nor parties show high levels of interest in the European Elections is tied to the European Parliament itself. The European Parliament is not an especially powerful institution. Within the EU it is slightly less powerful than the Council, the forum for national government ministers, and so this is already a bad start, but even if its powers were equal to the Council, it would remain much less powerful than any national Parliament. Compared to national governments and the powers they hold over taxation, vast areas of government spending, healthcare, education and literal war and peace, the powers of the EU can feel insignificant. This difference in political power leads voters and parties to distinguish between first- and second-order elections. First-order elections are seen as the most important and are usually the elections for the national executive (which may be a general election for a Parliament or the election of a President depending on the political system in that country). Second-order elections involve voting for positions of less significant political power and so attract less attention. These tend to include regional, local and European elections. In a crude sense, parties therefore do not show much interest in the European Elections because they care much less about whether they win. Even if they lose, the missed opportunities for the exercise of power are less important. From a position of principle, this can still be condemned as an irresponsible thing to do. Important decisions are made in the European Parliament and even with a relatively low turnout, parties have a responsibility to the electorate. Nonetheless, the lack of interest can be understood as a rational decision. Looking to the future, it’s possible that this situation will change. Either the European Parliament may start to exercise power over areas that are more politically salient to the general public or the EU itself may become so politically salient that citizens get more involved in EU processes and elections. As far as the upcoming elections are concerned, the relatively low turnout that has become the norm suggests a lot of room for motivated and energising campaigns to create some upsets. Normally strategies that rely on winning votes from non-voters are particularly difficult to pull off as non-voters are, unsurprisingly, difficult to get to turn out and vote. Nonetheless, there is a large group of non-voters in the European Elections who normally do vote in their national elections. These are people who believe in voting as a method of delivering change and who are used to going out to vote. They simply have not been given that same motivation and belief when it comes to European Elections. There is therefore a potential pool of support that either populists or pro-Europeans could convincingly tap into in 2019. New populist parties, having already built up an image as disruptive, change-bringing forces, could well benefit from this. Macron’s La République En Marche will try to mimic this trick too. A dynamic of mobilisation and counter-mobilisation could then build between these two opposing forces. The end result could be a higher voter turnout in 2019 with the most pro-EU group (ALDE) and the anti-EU groups (ENF and EFDD) as the beneficiaries while the big-tent groups of the EPP and S&D lose out. Indeed some early projections of the final result suggest that this is exactly what will happen. It’s impossible to say for now whether this will come to pass, but if we’ve learnt anything recently, it’s that change may come sooner than we think. This article was originally published on European Votes 2019, here.